This experiment was conducted by J.J. Thomson (Sir Joseph John Thomson) in the year 1897. This experiment helped to discover electron. 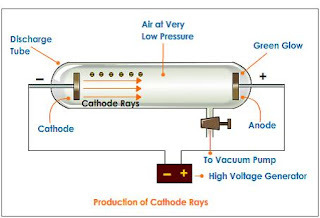 According to J.J. Thomson, the cathode rays consisted of very light, small and negatively charged particles. 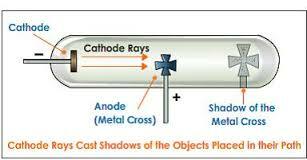 A cathode tube ray was taken in which there were 2 electrodes i.e. 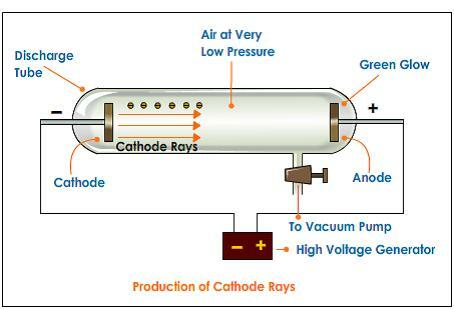 Anode(+ve) and the cathode (-ve). It was observed that when the gas was at 1atm(atmospheric pressure) no change was seen in the tube. When the pressure was decreased inside the tube, the tube started glowing. 1) A thin metal foil was placed between the 2 electrodes. Observation: The metal foil started to glow due to heat. Conclusion: This beam of ray was made up of high energy particles. 2) An object was placed between the 2 electrodes. Observation: A sharp shadow was formed on the anode. 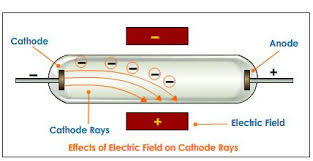 Conclusion: The beam of rays were travelling from cathode to anode. 3) A light weight paddle wheel was placed between the 2 electrodes. Observation: The paddle started rotating. Conclusion: The beam contains high energy particles, which on striking the paddle wheel rotates it. 4) An external electric field was placed. Observation: The beam of light deflected towards the positive plate. Conclusion: Particles of the beam are negatively charged.